FileVault is nationwide and our service can come to you! FileVault can come to your location anywhere in Illinois, securely transfer your documents, medical data, tapes, slide and information to our secure storage facility and you will gain peace of mind. We know that you are concerned about your records storage, corporate information security, accessibility, workflow, and compliance. You may also have space concerns. Our records management program is set up to relive these concerns efficiently and effectively, irrespective of the quantity of files or the type of media, whether paper, fiche, magnetic – or tissue samples. When you trust someone with your offsite date, you’re effectively entrusting them with your business. Our data protection is secure and built to suit your needs. Need an item overnight? We will overnight anything you need from your stored records so you can have your files when you need them most. We are here to help you manage your records no matter what you need and where. Proper, legal, secure destruction of your data and records is your job: let FileVault help you get it done perfectly. Are you in control of the life cycle of your corporate information? Do you operate under a records retention program that determines when it’s time to destroy records? FileVault can help with that as well. Our data shredding and destruction program is built around your business and the laws that are in place to protect secure data. Need help with converting from paper to digital? We can help you there too, with our paperless conversion program. No matter where you are in the United States, FileVault is your ideal records management solution. Filevault is an Off Site Storage & Data Backup facility. 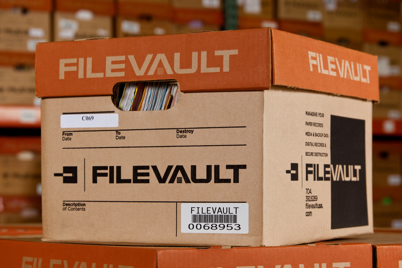 We store records for Medical, Law, Banking & Financial, Real Estate, Insurance Agencies, Biospecimen and much more.